Roger Federer is a hot favourite to win the Australian Open, but Marin Cilic has been in spectacular form in Melbourne. Eyeing a 20th grand slam title, Federer is expected to win Sunday's final on Rod Laver Arena. The Swiss maestro has also dominated Cilic previously, winning eight of their nine matches. However, the Croatian has powered his way into the decider and looked particularly impressive in his quarter-final against Rafael Nadal before the Spaniard had to retire through injury. 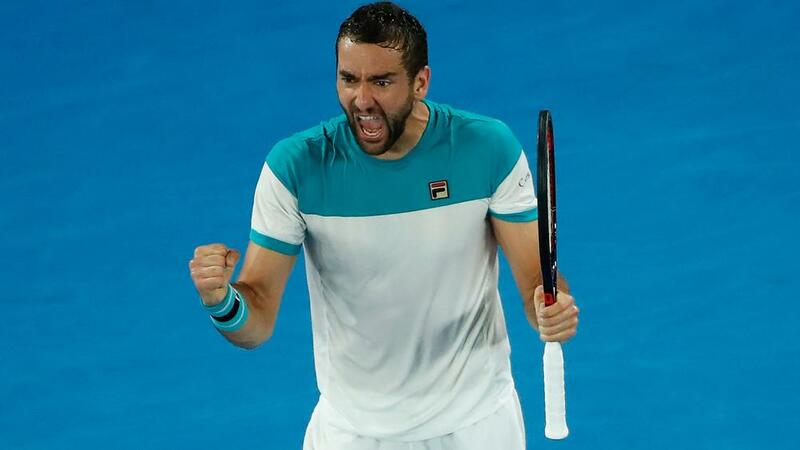 While Federer is a deserved favourite, Cilic has the weapons to challenge the 36-year-old. We look at how he can cause a huge upset. This is an absolute must for Cilic, who is into a third grand slam final having won one of the previous two. Considered one of his biggest strengths, Cilic needs to make a high percentage of first serves to have any chance. Federer will capitalise on any lapses and he will push the 29-year-old back if given repeated looks at second serves. It was an area that stood up well for Cilic as his quarter-final against Nadal went on and, facing one of the best serves in the sport, it must be near its best again. This was a major reason why Cilic got past Nadal, with his forehand allowing him to dictate and putting the match on his racquet. Federer will not hesitate to attack, so the 2014 US Open champion must strike early in points. That is sure to lead to unforced errors, but any other approach and Cilic will simply allow Federer to control the match and likely claim a sixth Australian Open crown. A front-foot mindset is a must for the underdog, who said: "Comparing to the end of the last year. I'm playing much, much more aggressive. I'm feeling that I am, for most of the shots, hitting them really, really good. "From the return, moving, forehand, backhand, serving, I think everything is in a good, solid spot. Feeling really excited about the final, too." If the serve is on, Cilic will be able to get the first strike during points and his forehand should at least allow him some good moments. After his win over Kyle Edmund in the semi-finals, Cilic said his game was not too dissimilar to Federer's. The problem is, no-one outdoes arguably the greatest of all-time at his own game. Cilic has been able to own the net at different times during the year's first major, and he must not be afraid to try the same against Federer. Still, the Croatian is likely to need one of the best performances of his career to win a second grand slam title.